ArtHotel artist residency program has been established to offer 2 Queens-based artists, a $3,000 stipend each, for a 3-month period of time to work outside of their traditional environment and daily life. The artist will not live on-site. Artists of any discipline may apply. As the organizer of this residency, QCA’s view is that artists are creative and valuable community members who are often experts at creative problem solving and encouraging neighbors to interact, in addition to being specialists who make works of art. ArtHotel Residency is not a traditional residency where the artists work in a place of isolation, but a place where artists retreat to create their work and have an opportunity to focus inwardly on it and share her/his process with the public. Artists will be working in a designated space within the hotel that will be publically viewed. Artists must be comfortable with an open working environment. Artists must be present a minimum of 20 hours of open studio time per 3-month residency to engage with interested public to share their vision and creativity. QCA will act as the residency organizer of ArtHotel and will facilitate the selection process, as well as provide assistance to both the artist and the residency host site throughout the course of the residency. The hotels to be acting as hosts for the 2018 QCA ArtHotel Residency include The Paper Factory Hotel, located in LIC and SpringHill Suites NY LaGuardia located in Corona. Our hotel partners, The Paper Factory Hotel and the Springhill Suites will provide space for a residency artist to be active in creating, practicing or performing their art making in a public environment. The artist’s workspace and equipment will be secured and remain undisturbed over the course of the residency. A community room, or other place within the hotel facility maybe accessed to host public events or workshops, during the residency. The artist will have access to Wi-Fi. Each artist selected to participate will work with each host site to determine the work schedule. * Performance or Media arts - up to 2 works samples not to exceed 5 minutes in total of video or audio. Work samples maybe submitted in one of the following formats: MP3, MP4, WAV, MOV. Emerging artist working in most media will be considered. Artists working with toxic materials, hazardous machinery, etc. will not be considered due to limitations within the building. Oil painting and epoxy resin are permitted. Artists must be comfortable to work in an open studio setting where the public is able to interact with the artist during public hours and working in a collaborative environment and commit to set hours. Culminating public event, no later than June 30, 2018. Artist residents will be selected through an Open Call application process. QCA administrators and representatives from the participating hotels will review applications. The panel will make a final determination of residency assignment that will include the application process and an in-person interview. Two artists will be selected to receive a $3000 stipend each for residency. The stipend will be paid at the beginning of the residency. Artists must be present a minimum of 20 hours of open studio time per 3-month residency. Artists will be expected to present their work or work in progress during the residency either as a public lecture or demonstration or exhibition as a public event. QCA will help in marketing all activities associated with the ArtHotel Residency. Artists will have access to Materials for the Arts through QCA. Questions regarding QCA ArtHotel Residency? Contact Daniel Bamba, Queens Arts Fund Manager, DBamba@queenscouncilarts.org or 347.505.3017. 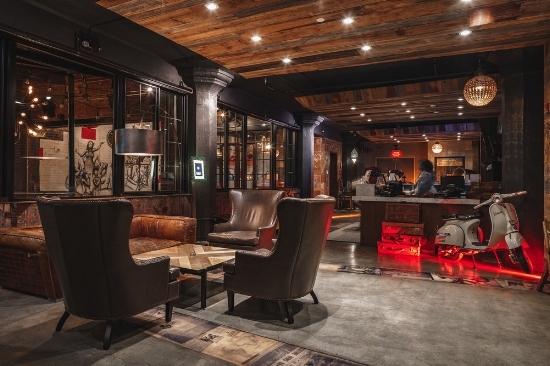 The QCA ArtHotel Residency is a program of the Queens Council on the Arts, Queens Art Fund that is supported in part by the NYC Department of Cultural Affairs, Greater NY Arts Development Fund, in partnership with the NYC Council and in partnership with the Paper Factory Hotel and the SpringHill Suites LaGuardia. Located in the Kaufman Arts District, Queens Council on the Arts’ mission is to foster and develop the arts in Queens County and to support individual artists and arts organizations in presenting their cultural diversity for the benefit of the community. Since its founding in 1966, QCA has evolved into a wide-ranging arts service organization fostering live cultural experiences and providing grants, professional development, and education services throughout the borough including The Queens Arts Fund, Su Casa Residency program, Artist Commissioning Program, Professional Development workshops, Artist Leaders Circles, LAB and High School to Art School Portfolio Development Program. More information can be found at http://www.queenscouncilarts.org.